If you want an agent to list your home, beware of anyone who suggests an unreasonably high asking price. An agent might suggest a high price to get your business, and then seek a lower price later when little traffic or interest has been generated. Meanwhile, you’ve lost the critical first weeks following the initial listing, and your negotiating position has been weakened. Check out your agent’s experience. As with most professions, experience is an important key to success in real estate. Experienced agents who know the market will have the best chance of quickly and smoothly helping you sell your home. Also check out your agent’s productivity. The number of transactions an agent is handling indicates professional commitment. Is the agent just dabbling, or depending on real estate sales as their sole means of income? You should be looking for someone who is busy with real estate, but not too busy or distracted to give you the kind of attention you need. An agent who has a real office, and possibly a support staff would most likely be a good choice. You need straightforward, reliable information even if it isn’t flattering regarding the home you’re selling, or a home you may be considering to buy. Is the agent interested in sharing expertise and market knowledge in an honest and straightforward manner? Does the agent seem too inclined toward telling you what you want to hear? You’ll feel more confident about your home buying journey when you understand what is required of you and every other person who is involved in the transaction. This guide takes you through it, and shows you that you’re only 11 steps away from buying a home. Your credit reports are an ongoing look at how you manage your finances. You must know exactly what your credit reports say about your financial history before you apply for a mortgage, because the reports play an important role in the mortgage approval process and in determining the interest rate and other loan terms that a lender offers you. If you haven’t looked at your credit reports, you might be surprised at their contents, because errors are common. The sooner you know what’s on your report, the sooner you can take action to correct it. Finding the right loan and lender is crucial to your home buying success. It’s up to you to determine which lender is best for your needs, and it’s always a good idea to have at least a bit of background about the loan process before you talk to a lender. Talk with your bank first, but definitely talk to a few mortgage brokers. Mortgage brokers can compare the rates from many different lenders and often find the best rates. Do you know how much house you can afford? Unless you’ve talked with a lender or broker you probably don’t have a realistic idea of what you can afford. Pre-approval helps you in other ways. Consider this scenario. A home seller gets two similar offers. One is accompanied by a letter from the buyer’s bank that states she is pre-approved for a mortgage in the amount of the offer. The other has no supporting documents. Which offer do you think the seller will consider first? A pre-approved buyer makes a stronger offer and is more likely to get the property, especially in a competitive market. Buying a home isn’t as difficult as you might think, even if you’re short on funds, but the process will go a lot smoother if you get familiar with your real estate market and narrow down your wants and needs before you start looking at houses. Real estate agents represent buyers, sellers, or both – and in some states they can work as neutral facilitators for either party. It’s essential to understand agent duties and loyalties before you make that first phone call. Know who your agent works for before you start the purchase process. Your agent will give you multiple listing sheets to study. I’m sure you’ll also pick up House For Sale magazines and read classified ads in your local newspapers. You’ll probably spend time surfing internet sites such as realtor.com for homes. You might even plan afternoon drives to preview neighborhoods. Those are all excellent ways to see what’s available. How’s the resale potential? Contract contingency basis, What kind of house is it? Site built, modular, manufactured? Do others have a right to use the property? Can you live with the deed restrictions? Is the reported square footage accurate? Is the heating/cooling system efficient? There’s no one set of instructions that can cover all the differences in real estate laws and customs that exist throughout the United States, so the mechanics of making an offer and its specific contingencies depend greatly on your location. However, there are some home buying tips that can help you fine-tune your offer, no matter where you live. What comes with the house? Contract considerations – what should the seller disclose? Determine if lead paint disclosures are required. Decide how much to offer? Asking for possession before closing. ‘For sale by owner’ (FSBO) purchases may need special considerations. What are the taxes? Are there any homeowner’ association dues? In some states, home inspections are accomplished before the final purchase contract is signed. In other states, inspections take place after an offer is finalized. No matter when you do them, it’s critical to decide which inspections and tests you want to perform. Talk with your real estate agent or other advisor to find out when inspections should be handled and if additional types of testing are important for your specific area. As your closing date nears, everyone involved in your real estate transaction should check its progress on a daily basis, because staying on top of things means you’ll know immediately if there’s a problem that needs to be handled. Here’s a bit of information that focuses on a few common problems that home buyers must deal with before they close on a house. Most of your home-buying problems are behind you now and you’re on your way to closing, also called settlement – the event that transfers ownership of the property to you. Just a few more things to learn, a few more things to do, and you’re there! Never hesitate to ask questions. Ask as many questions as necessary to help you understand the entire home buying process. You are making a long term commitment and spending a major amount of money – you’ll feel much better about the transaction if you stay informed and understand what’s happening every step along the way. Please feel free to contact Arne if you have additional questions. Arne is true professional. He helped us the entire way through the sale and the purchase of our new home. He took us through everything one step at a time, allowing us to rely on his knowledge and advice. He made what is a usually a stressful situation, easy. Arne DeWitt is a friendly professional who is both knowledgeable about the marketplace and accessible – a rare combination in today’s business world. I’ve been a client for 10 years and I’d recommend him without reservation to anyone involved in real estate. The Orange County real estate market is very dynamic and it was great to have someone with Arne’s expertise by our side when we decided to buy a new home and sell our former home. Arne and his staff were great and extremely efficient. They really know the area and were able to help us make the right choices. I took a new job in Orange County from out of state and did not know the area. Arne listened to what we were looking for, took care of us in a helpful, professional manner and helped us find a great house. While I do not plan on moving, if I were to move again I would definitely use Arne. I highly recommend Arne DeWitt as a real estate broker. Arne helped us sell our first house in Dana Point. It was a very stressful time for us because we needed to close the sale of our Dana Point house in order to acquire our current house. It was not an easy sale because our association was in litigation and there were issues concerning the construction of the house. 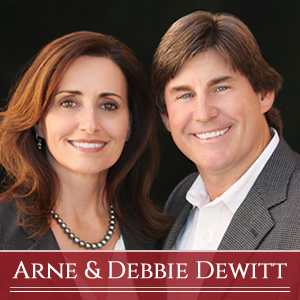 Despite these challenges, Arne worked diligently and, through his experience and contacts we closed the sale of our Dana Point house in time to obtain our new house. I would highly recommend Arne to my friends and clients. Arne is a true professional in his field. My wife and I were truly impressed with his knowledge of the local real estate market and his ability to connect with us on a personal level. When we found our perfect home we couldn’t believe how easy the purchase process was and before we knew it, we were moving into our new home! We have known Arne Dewitt for the past 14 years. He had helped us to purchase and sell our two previous homes, and we are also in process of selling and buying another home. His efficiency and honesty, integrity, confidence and knowledge of market and the area is impeccable. His personal report and knowing most of the other agents helped us during closing and selling our homes. We are looking forward to work with him in the future.